The current Pokémon TV anime series is ending. In the most recent episode, there might have been kissing. This, however, would not be the first time Ash has been smooched. As Kotaku previously pointed out, in Pokémon XYZ, Serena’s crush on Ash is canon. She, however, won’t be going to Alola for the Sun and Moon anime, which will feature a far goofier Ash than his current incarnation. Maybe her decision is for the best, then. If Serena did kiss Ash, it was not his first. In Pokémon Movie 2000, Melody gave Ash a “traditional greeting kiss,” causing Misty to get all jealous. 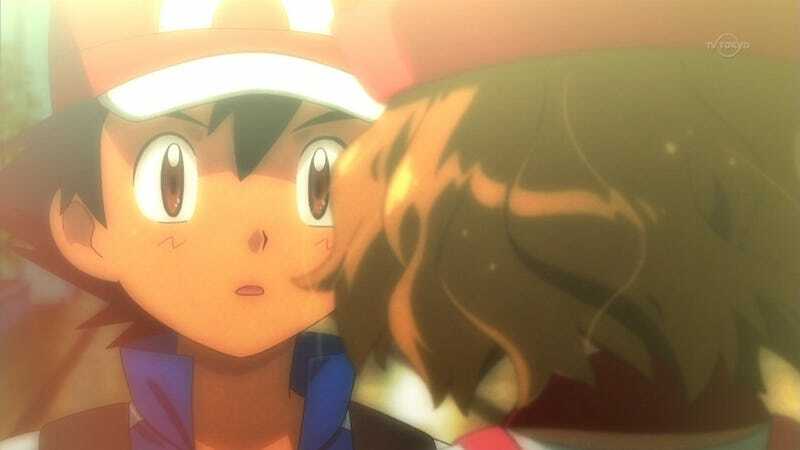 At the end of 2002's Pokémon Heroes, a girl gives Ash a peck on the cheek. What makes this one interesting, is that we are unsure who gave Ash the kiss. It could’ve been Latias as Bianca or actually Bianca (read evidence for each theory here).